Collection station availableType: UltrabookBrand: LenovoProcessor: Intel Core i5 4th Gen.
256GB M.2 Sata Storage. 8GB DDR4 RAM. Microsoft Office Pro 2019 (with excel, etc.). 128GB SSD; WiFi. Below is an overview of its components. 8GB RAM; Bluetooth. Lenovo Power Adapter; Battery. Windows 10; Webcam. 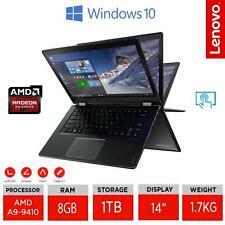 Type: UltrabookBrand: LenovoProcessor: Intel Core i5 4th Gen. SHELF CODE: M18-6 3GSJ. WHAT'SNOT INCLUDED: - 3-Pin clover shaped power lead / Other accessories / Cables / Software / Drivers etc. WHAT'S INCLUDED: - Laptop with power adapter ONLY. OS is not installed. Brand: SonyProcessor: Intel Core i5 3rd Gen.
Lenovo ThinkPad X240. 256GB Solid State Drive. 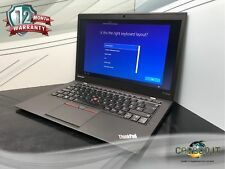 Lenovo ThinkPad X280 ultrabook, new model. - 256 Gb SSD Samsung. - Excellent battery. - Usb 3.0, Usb 3.1, Usb Type-C, Thunderbolt 3, HDMI. Dell Latitude E7440. Battery Life is Healthy. Headphone/microphone combo jack. HDMI, Mini Display Port. Showing signs of use, the odd mark, scratch, buff to be expected! SEE Last Image. Adobe Reader- Good For Viewing, Printing, Signing, and Annotating PDFs. 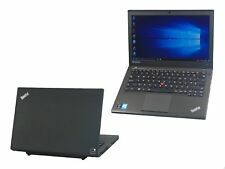 Lenovo T460 Laptop. 500GB Hard Disk Drive. Windows 10 Professional 64 bit. New style, COA (Certificate of Authenticity) embedded in the BIOS. Dual Batteries - 1x Internal / 1x External - Lasts Many Hours. 14.0" FHD (1920 x 1080) Anti-Glare, SLP Panel, IR CAM/Mic, WLAN, Narrow Bezel, Aluminum, Non Touch. Latitude’s superior security, versatility and accessories empower the way you work because your success relies on the ability to maintain office-level productivity, wherever your job takes you. Type: UltrabookBrand: DellProcessor: Intel Core i7 8th Gen.
Collection station availableType: UltrabookBrand: LenovoProcessor: Intel Core i7 5th Gen.
Ending Saturday at 7:11PM BST1d 20hType: UltrabookBrand: DellProcessor: Intel Core i7 4th Gen. The HP ZBook Dock with Thunderbolt 3 quickly connects and powers your HP ZBook to compatible devices and provides support for dual 4K monitors at native resolutions. Be productive in any situation. Quickly and easily transfer data and connect to devices. Dell Latitude E6220 ultraportable laptop for sale. 4GB ddr3 ram. This laptop is very fast, portable, lightweight and smart. Ideal machine for personal use, office use or university use! The laptop is cleaned externally and ready to use straight out of the box! Type: UltrabookBrand: DellProcessor: Intel Core i5 2nd Gen.
WHAT'S INCLUDED: - Laptop ONLY. WHAT'SNOT INCLUDED: - Power adapter / Other accessories / Cables / Software / Drivers etc. TESTING: - The unit Powers up to BIOS fine with no errors or passwords. Fans run fine. Hard drive: 256GB SSD. RAM: 8GB DDR3L SDRAM. This Amazing Fast Slim Dell latitude E7440 Laptop is in Good Condition ! Windows 10 Professional 64 bit. 14" Screen size. All Rubber feet intact. Battery Condition Excellent. Back Lit Keyboard. Bluetooth 4.0. Ending Sunday at 7:35PM BST2d 20hType: UltrabookBrand: DellProcessor: Intel Core i7 4th Gen.
DELL LATITUDE E7440 - 14.1" HD SCREEN, I7-4600U 2.1GHZ CPU, 8GB RAM, 240GB SSD, WINDOWS 10 PROFESSIONAL 64. For sale is this super high spec Dell Latitude E7440 Laptop. 8GB DDR3L RAM. Genuine Windows 10 Professional 64-Bit. It also has a fingerprint scanner compatible with Windows Hello. The screen has a couple of pressure mark patches visible when the screen is displaying images which are not black in those areas. HP ENVY 17" laptop i7 4700MQ. Dell Latitude E7440 - spares or repair (working) motherboard OK! The term ultrabook was originally developed by the US corporation Intel to refer to very fast laptop computers that maximise battery life. These days, you will find a much wider ultrabook definition in use because many computer manufacturers use it to mean any small and lightweight laptop – which might otherwise be called a notebook – but which has many of the high-end features that are more commonly associated with tower PCs. Read on to find out more about this class of computer and for advice on finding an ultrabook that will best suit you. What are the key characteristics of an ultrabook? Long battery life of around six hours. Quick resume speed from hibernation. What connectivity should an ultrabook come with? The range of ports that are associated with ultrabooks vary from model to model. Look for at least a couple of USB ports so that you can plug in peripherals, such as a mouse or an external hard drive. An audio in/out jack is a common feature and allows you to plug in a microphone or send the computer's audio output to a pair of headphones. Finally, many ultrabooks will offer an HDMI output socket, which allows you to connect the computer to a monitor or TV screen. What screen size is most useful on an ultrabook? This is a key consideration for purchasers because the size of the screen affects an ultrabook's portability. The larger it is, the easier it is to work with, but models with smaller screens stow away with greater ease. A 14 inch screen is the standard size for most ultrabooks, although you can find them ranging from 11.6 inches to 15.6 inches at the extreme ends of the scale. What is Intel's Smart Connect technology? This is a feature of some ultrabooks that is made possible by Intel's design architecture for this class of PC. It allows your computer to receive notifications – such as emails or instant messaging – while it is in sleep mode, without affecting battery life too much.